I get emails asking me for various recommendations a lot so I thought I would create a one-stop shop for all of my favorite products and services here as well as share exclusive coupon codes and specials when available as well. You can click the topic below to jump to a section. There are some affiliate links below but these are all products/services I have personally used and recommend. Using my affiliate links helps support this blog at no additional cost to you. Bluehost– I started my blog on the free Blogger platform but later switched to self-hoted WordPress hosted on Bluehost. I highly recommend new bloggers start with self-hosted WordPress from the start to avoid the hassle of switching and I recommend Bluehost for their great prices. If you sign up for a year (starting as low as $3.95 a month with a money back guarantee) you can get a free domain name as well! I have a step by step tutorial for getting your blog set up in just 15 minutes here. Genesis– If you have a WordPress blog the Genesis Framework is the gold standard in themes. It provides the “skeleton” if you will for your blog and makes it easy to switch themes and add code to your website without being a tech guru. I have a full tutorial for installing a Genesis Theme to your WordPress Blog here. Foodie Pro– My blog uses the Foodie Pro theme (built on the Genesis Framework of course!) and it’s an incredibly versatile theme. It’s easy to customize and create a variety of different website looks with just this one theme. I highly recommend it. ConvertKit- I consider ConvertKit an advanced blogging tool-it’s a very intuitive and easy to use email marketing platform for bloggers who are ready to build their email list and really serve their email subscribers better. You can read more about it here and also in this article about why it’s important to build an email list for bloggers. LeadPages- Another tool for more advanced bloggers is LeadPages. Leadpages is a platform I just adore for building my email list abnd marketing my blog’s products and services like my free Organizing eCourse. It’s very easy to use and makes gorgeous landing pages and versatile email subscription forms. See a video Introduction to Leadpages below. Making Sense of Affiliate Marketing eCourse– Michelle from the blog Making Sense of Cents makes over $100,000 PER MONTH on her blog, with the majority of that coming from affiliate programs. I have personally taken her course and even as a veteran blogger I learned a great deal and saw a 50% increase in my affiliate income the very first month. Affiliate income is one of the easiest ways to earn from your blog and unlike ad revenue anyone can be successful with is-no matter how small your blog is! I highly recommend her course, it pays for itself very quickly if you implement her strategies! The Food Photography Book– Nagi from Recipe Tin Eats built her food blog incredibly fast in no small part thanks to her amazing food photography. When I started branching out into more recipes on my blog I turned to her Food Photography Book to help me improve my photography and it made a huge difference. Her simple tips saved me a lot of time and energy in improving my recipe photographs. Great investment for food bloggers! Sony α6000– When I first started my blog I used a Canon Rebel T3i camera and loved it-I actually went through two of them over the years! When it came time to upgrade I did an extensive amount of research online and found the Sony α6000 through the recommendation of another blogger who had amazing pictures on her blog. The α6000 is different from a standard DSLR in that it is mirrorless so it has the benefit of being much smaller and more compact. It also has the most amazingly sharp focus I’ve ever seen on a camera. I use it on the AutoIntelligent setting 99.9% of the time because it’s just as good if not better than what I can do on Manual. I highly recommend it. I bought just the body and use it with this fixed 30 mm lens. Vanguard Alta Pro Tripod– After blogging for 5 years I realized it was time to upgrade to a “real” tripod. I have shaky hands and do almost all of my blog photography on a tripod to get clear, crisp images and my old $30 tripod was not cutting it. When I received my Vanguard Alta Pro in the mail I was so mad at myself for waiting so long to upgrade. This tripod is incredibly sturdy, easy to adjust and has that amazing overhead arm that lets you get the straight overhead shots that are particularly popular in food photography. Another great investment piece-I’m confident this tripod will last for years! Adobe Photoshop & Creative Cloud– While I do still occasionally use PicMonkey I currently use the Adobe Creative Cloud bundle because I need the more advanced features to do graphic design and make printables for my readers. I love the Creative Cloud because rather than spend a ton of money on buying software and then have it need upgrading in a couple of years, I can pay a monthly subscription and choose options starting at $9.99 a month for Photoshop and Lightroom. Studio Photography Light Set– I knew I needed to invest in some lights for my photos and video when we found out we were moving to England last year. It’s bee a great blessing not only for overcast days but it allows me to take pictures at night rather than always trying to fit in photoshoots in the daytime. This set is under $100 and works well for my needs. Just an FYI though, not the easiest to set up/take down so probably more ideal if you would use them infrequently or have a dedicated office space to leave them set up. Instapot– I waited forever to buy an Instapot and I wish I hadn’t. It makes cooking so insanely fast and it my new favorite toy in the kitchen! Worth it for busy families like ours! Crock-Pot– If you don’t have an Instapot this is definitely another tool I couldn’t live without in the kitchen, this is the one we used prior to buying the Instapot, it’s a great one and inexpensive. Silicone Baking Mats– I became a baking mat devotee when I was a newlywed and started baking regularly. Silicone baking mats make cleanup so much easier and reduce the need for cooking sprays or parchment paper. They last forever too-I still have my first set from 2007! Baker’s Joy Spray– I link to this baking spray in almost all of my baking recipes since I discovered it a few years ago-it’s so much easier and less messy than greasing and flouring a pan! KitchenAid Mixer– Oh my goodness one of the things I’ll be most happy about when we return to the US from England will be using my KitchenAid mixer without a giant transformer! I of course wasn’t going to store it when we moved overseas but it’s incompatible with the voltage here so every time I bake I end up lugging it to my living room to plug into the transformer our TV runs off of-it’s comical! But seriously, best mixer ever. Mine is literally almost twenty years old, I’ve had to replace one whisk attachment but other than that it’s running strong! 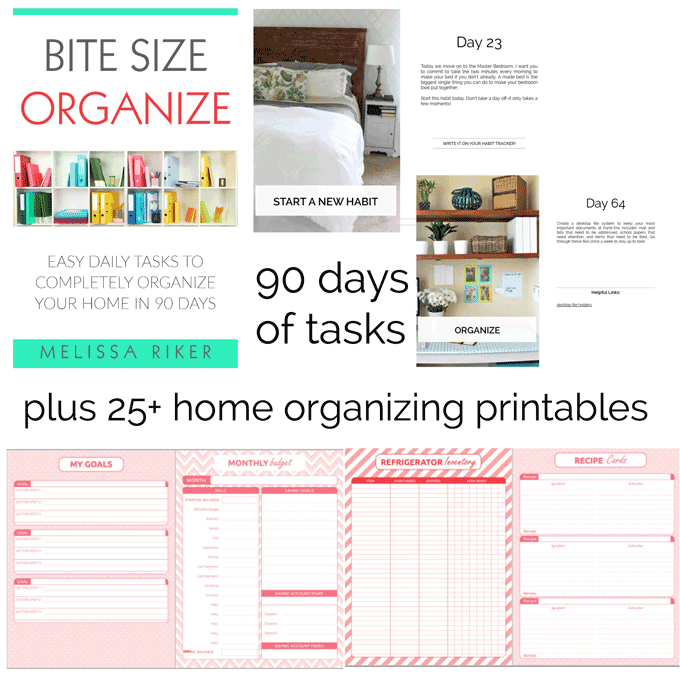 Bite Size Organize– Shameless plug here, Bite Sizer Organize is the book that I wrote to help break down organizing your ENTIRE home into small, bite size steps over the course of 90 days. It takes away the overwhelm that so many of my readers have written to me about. It comes with over 30 pages of home binder organizing printables as well! I’ve had so much amazing feedback from it with readers finally gaining control over the chaos in their homes! AirBNB– We use AirBNB almost exclusively to find homes to stay in when we are traveling because we prefer an entire home or apartment to a hotel with our three young boys. It’s also a nice way to find places beyond the traditional tourist areas and really experience a destination in a more authentic way. Click this link to get $20 off your first trip. TripAdvisor- While many people refer to TripAdvisor for destination reviews you can also find great places to stay here too. We have found some amazing cottage rentals across Europe using the TripAdvisor Vacation Rental search. Booking.com- This is one of the main websites to use to search for hotels in Europe and we use it often here in England for quick trips and stopovers (many AirBNB rentals have minimum of 3 days.) If you are a larger family it is worthwhile to note that Booking.com will come back with some wonky room options much of the time-it will try to break our family of 5 into five single rooms which obviously doesn’t work, but again we are in Europe where larger hotel rooms and suites are not the norm. Also, I highly recommend reading the actual reviews before deciding on a place with this site as well. Carnival Cruise Line- I am a little biased because I’ve only cruised on Carnival but we will be taking our 6th cruise in as many years this summer and we always have a blast. We started with Carnival when my youngest was just a baby because of Carnival’s excellent kid’s clubs. They are also the only cruise line I know of that will care for diapered children at no additional cost. Childcare starts at age 2 and runs a morning, afternoon and evening session until 10pm. You can pay for additional hours after 10 if you choose. We usually fit our family of 5 in a Deluxe Oceanview room comfortably. I will also add it’s worthwhile to speak to their reps on the phone-we have had the same representative with them since our first cruise and she’s amazing, always helping us find exactly the cruise we want working with our military leave, often with short notice. See some of my cruise blog posts here and here. CruiseCritic.com– If you like to cruise I highly recommend the reviews and community forums at Cruise Critic. They have an app too! I love reading about other’s experiences on the ships and hearing who the entertainment is before we leave on a planned cruise.